Limited edition 7" series on smokey grey vinyl with custom LITA juke-box style sleeve in a poly bag with custom die-cut sticker. Other artists in the series include Iggy Pop & Zig Zags covering Betty Davis, Mark Lanegan covering Karen Dalton, and Sweet Tea (feat. Alex Maas of the Black Angels & Erika Wennerstrom of the Heartless Bastards) covering Wendy Rene. More releases in the series to be announced. 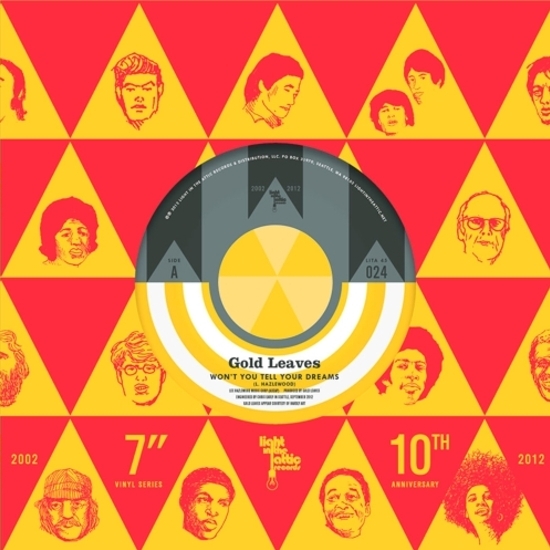 In 2011, Seattle band Gold Leaves released one of our favorite albums of the year. The Ornament is their debut long player and was released by Hardly Art/Sub Pop. We’ve been obsessing over their sound ever since and are honored to have the band contributing a track for our 10 year anniversary 45 singles series. For the series, Gold Leaves record a hazy take on Lee Hazlewood’s “Won’t You Tell Your Dreams.” Found on the flip side is Hazlewood’s version, which was originally included on his solo album Requiem For An Almost Lady, released in 1971 on his label LHI. A-side is produced by Gold Leaves, engineered by Chris Early, and recorded in Seattle in September 2012. B-side features Lee’s original version as remastered by John Baldwin for our recent compilation Lee Hazlewood – The LHI Years: Singles, Nudes, & Backsides (1968-71). Other artists in the series include Iggy Pop & Zig Zags covering Betty Davis, Mark Lanegan covering Karen Dalton, Charles Bradley & The Menahan Street Band covering Rodriguez, and Sweet Tea (feat. Alex Maas of the Black Angels & Erika Wennerstrom of the Heartless Bastards) covering Wendy Rene. More releases in the series to be announced.